The photograph, which was clicked by Associated Press photographer Vincent Yu, went viral after it was widely shared by many on social media. "Thank you, New Zealand Police. For your care & respect," read one of the many comments lauding the gesture of the 24-year-old officer. constable Michelle Evans, who joined the police force three years ago, she wore the hijab and a rose in support of the Christchurch shooting victims and their families. Pictures of a police officer holding a semi-automatic rifle and wearing a hijab while guarding a cemetery, where a funeral for the Christchurch terror attack victims was being held, have gone viral on social media. 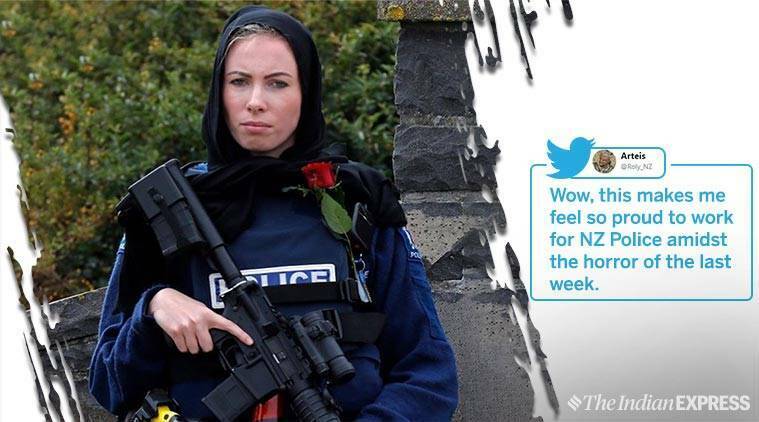 Identified as constable Michelle Evans, who joined the police force three years ago, she wore the hijab and a rose in support of the Christchurch shooting victims and their families, the Daily Mail reported. The photograph, which was clicked by Associated Press photographer Vincent Yu, went viral after it was widely shared by many on social media. “Thank you, New Zealand Police. For your care & respect,” read one of the many comments lauding the gesture of the 24-year-old officer. Thank you, New Zealand Police. For your care & respect.